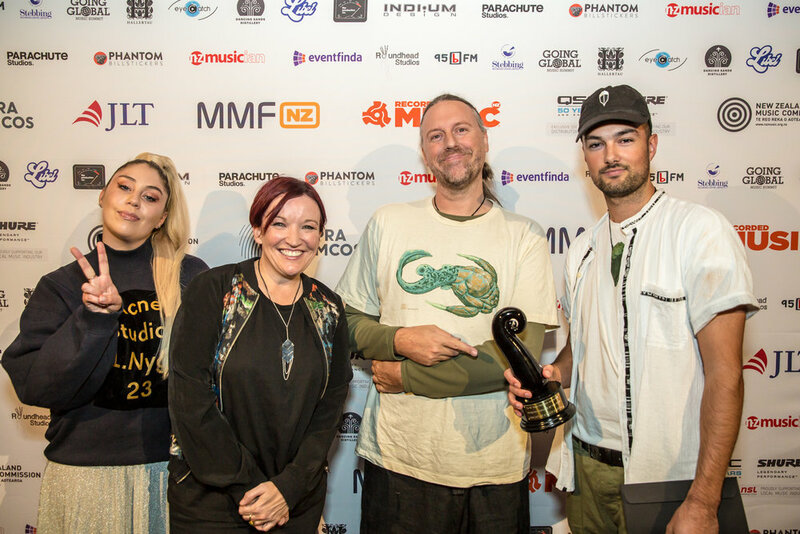 Tonight The Tuning Fork hosted managers, self managed artists, industry professionals, artists and bands, to celebrate the people working hard behind the scenes in the New Zealand music industry at the NZ Music Manager’s Awards. Alastair Burns was awarded the prestigious Recorded Music NZ ‘Manager of the Year' award for the second consecutive year. It honoured his work predominately with Julia Jacklin and Marlon Williams, who's critically acclaimed new album debuted no 1 in NZ and No 8 in Australia. Marlon is currently in the middle of a world tour. 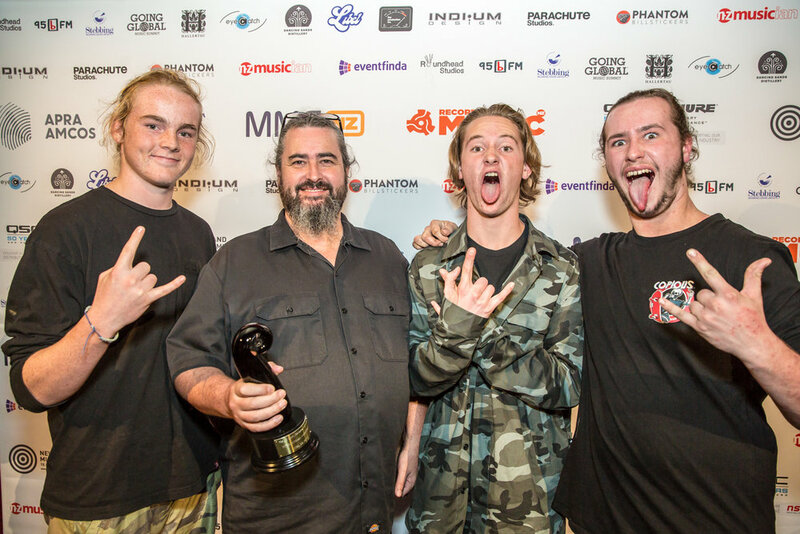 The New Zealand Music Commission ‘International Achievement’ award was given to Niel de Jong for his work with Te Reo metal band Alien Weaponry. Amongst their many achievements over the last year they signed with Napalm Records, one of Europe’s two biggest independent metal labels as well as German based agency das Machine, and are about to embark on a big European tour. The ‘Emerging Manager of the Year’ award is for managers who have just started managing in the last two years. The award was won by Chris Chetland and Callum McDougall for their co-management of Rei. Rei’s release, ‘A Place to Stand’, went straight to #1 on the iTunes Hip Hop album charts, beating Kendrick Lamar’s ‘Damn’ for the top spot. It also reached #14 on the NZ Albums charts. The remix of his single ‘Up2’ reached #3 on the Whitelabel.net world charts. Rei won Best Urban Album at the Waiata Māori Music Awards in 2017, and was also a finalist at the 2017 NZ Music Awards. He has just released his groundbreaking Te Reo Maori EP ‘Rangatira’. The award for ‘Breakthrough Manager of the Year’ went to Rikihana Douglas. His roster of SACHI, Montell2099, L.A. WOMEN and Matthew Young have had a busy year- SACHI have become a staple act in New Zealand fostering #1 viral ratings on Spotify. The first single from Montell2099 was a collaboration with US based 21 Savage who sports over 10.5 Million followers. Matthew Young's two singles 'Collect' and 'Hey' both went to #1 Air Play on Triple J. L.A Women’s debut single 'Hurricane Love' has over 4.4 Million streams. Rikihana has just signed SACHI to Casablanca US and L.A Women to Island UK. Tana Tupai and Avina Kelekolio from Tomorrow People won the APRA AMCOS ‘Best Self-Managed Artist’. Their EP ‘BBQ Reggae’ debuted No 1 in the NZ Charts. On top of their massive international and domestic touring schedule that saw them headline many festivals, they garnered cross over radio play and were also finalists in the 2017 VNZMA’s. The JLT ‘Best Independent Tour Award’ was won by Nick Atkinson for the Hopetoun Brown ‘Round the Horn’ Tour. The groundbreaker sold out tour was a very bold but successful concept as the band sailed from venue to venue in their own yacht, rowing all their instruments and a small PA into each new coastal venue in a tiny dinghy. Tonight the music venues were also in the spotlight, with the ‘Best Small Venue’ award going to Neck of the Woods, and the ‘Best Large Venue’ award going to The Civic, both Auckland venues. The Industry Champion Award sponsored by NSL distributors of Shure & QSC in NZ was awarded to NZ Music Foundation, recognizing their contribution in helping musicians in need and the opening of The Wellbeing Service which provides caring, confidential and practical assistance to kiwi music people from all parts of the music industry who are experiencing illness, distress and hardship and have nowhere else to turn. The MMF NZ Mentoring Program provides opportunities for new artists to have one on one time with industry specialists, and the Achievement Award recognises the efforts of a member who utilises the resources provided by the program and shows great initiative. This year the 'Achievement Award' was presented to Pennie Black who was mentored to help her band Hex with their USA tour and SXSW appearance. A special thanks to our supporting sponsors 95bFM, Dancing Sands Distillery, Eventfinda, Eyecatch, Going Global Music Summit, Hallertau, Indium Design, Libel, NZ Musician, Parachute Studios, Phantom Billboards, Red Bull, Roundhead Studios, Stebbing, The Production Company, The Tuning Fork.